Tyrell, a high school student at BCLA has actively participated in PYD’s career readiness program since November 2017. He took 7 weeks of classes at PYD where he learned professional skills such as communication, interviewing, and resume building. He then started an internship at the State Street Corporation after expressing an interest in mathematics and administration. He was hired in the beginning of February 2018 and thoroughly enjoyed his experience there. He received weekly support from his job coach, Mehdi, who helped him set goals and troubleshoot emerging challenges. 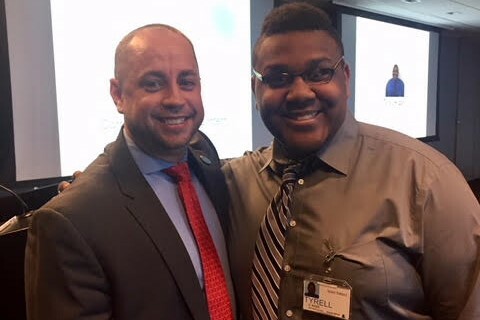 TK’s supervisor Rob Surratt was thrilled with his hard work and invited him to speak at a Boston Institute for Careers and Networking (ICAN) event hosted on State Street on March 6, 2018. TK spoke about his internship experience to a group of BPS students attending the event. His speech was detailed, funny, and inspiring and successfully engaged the audience while connecting with others. Great job, TK! Read TK’s full speech below. Click here to learn more about the PYD’s Pre-Employment Program. “I want to thank the Partners for Youth with Disabilities for allowing me to come to the program. I have been going to Saturday classes for 7 weeks at 95 Berkeley Street in Boston. The first time I went, I was extremely nervous, but was impressed with this fancy building. On each Saturday, I would arrive on time with a smile. At Saturday classes, we practiced interviewing skills. I was taught that I needed to be aware of how I was suiting and interacting with the interviewer. We also practiced communication skills. For example, I was taught to be careful with my words, avoiding random words. Because of this, I was prepared for the interview process. When I first met with Rob Surratt, I realized he was such a nice guy. I also realized that I would be well-supported. If I had not been in the training experience at Saturday classes, I would have been too nervous to engage in this first meeting. Now I am participating in the State Street internship three days a week. I am learning new things. For example, collating and alphabetizing were some of the tasks that I learned. Although they are not my favorite so far. But I have enjoyed learning how to do inventory, which means that I had to determine how many items are there in State Street. Some of the things I inventoried were to be expected, like pens, scissors, paper clips, etc. while others I am still puzzled over. Why does State Street need flashlights or a car charger? Who knows! On my internship days I arrive at work looking professional. I have to be presentable and formally dressed. My main accessories are my tie and my State Street ID badge. When I come in, I use the electronic access that connects with my ID badge and allows me to get into the building. When I first saw the 14th floor, I found it to be huge. I saw many busy employees, but some have the opportunity to speak with me. I always look for Venise or Robert to tell me what the objective of the day is. Once I understand what the objectives are, I get to working right away to accomplish my objectives. Although, all objectives cannot be accomplished in a single day. For example, my business card pile is large, and I need to transfer the information to an Excel Spreadsheet. While time consuming. The task is clear, and I will accomplish this objective eventually. My internship is important to me because it is providing me with the experience of what a business environment is about. It makes me feel proud that I have been given this opportunity. I would like to thank Mehdi for sharing his ideas and teaching me about the business environment during my Saturday classes. I would also like to thank him for helping me identify goals that are realistic for me. It is important to note that I feel accomplished thus far.